The following is a guest post from Mark Royal, Senior Principal at Hay Group, a global management consulting firm that works with leaders to transform strategy into reality. Hay Group develops talent, organizes people to be more effective and motivates them to perform at their best. Though frameworks for understanding engagement vary, the concept is commonly understood to capture levels of commitment and discretionary effort exhibited by employees. Engaged employees can be expected to display high levels of attachment to an organization and a strong desire to remain a part of it. Consequently, engaged employees are more likely to be willing to go above and beyond the formal requirements of the job, contribute organizational citizenship behaviors, pour extra effort into their work, and deliver superior performance. Researchers have long recognized that organizations can’t function through purely contractual relationships with employees. In the early twentieth century, for example, Chester Barnard, Elton Mayo, and others emphasized that organizations require cooperation from employees, not just compliance. Simple adherence to minimal role requirements is likely to have dysfunctional consequences in most settings. For example, unionized employees who “work to the rule” during contract disputes can quickly bring organizations to their knees. In our view, engagement has captured the attention of managers insofar as it raises the notion of cooperation to a higher level. While cooperation is required and, to some extent, expected of all employees, engagement involves performing above and beyond what’s anticipated. In that sense, engagement holds out to organizational leaders the prospect of increasing productivity (i.e., getting more output from a finite set of human capital resources). In an environment of increasing competition and a challenging global economy, where organizations are running leaner and forced to do more with less, tapping into the discretionary effort offered by engaged employees becomes all the more imperative for success in the marketplace. 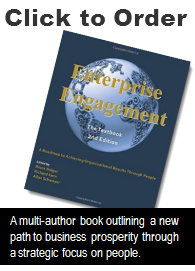 The ever-increasing pace of change in modern organizations also fosters interest in engagement. In fast-changing environments, it becomes all the more difficult to precisely specify roles and responsibilities across a diverse set of jobs. To the extent that employees at all levels are likely to be faced more frequently with unanticipated and ambiguous problem-solving and decision-making situations, employers must count on them to act on their own in ways that are consistent with company objectives based on their understanding of, and alignment with, organizational standards, cultures, and values. A final push for today’s emphasis on employee engagement comes from employees themselves. The redefinition of the social contract surrounding the employment relationship across all industries makes engagement a more pressing concern for many individuals. As the old loyalty-for-security bargain has eroded, the connections between individuals and organizations have grown more tenuous. Whereas a career was once defined as the steady movement over a period of time through a hierarchy of jobs in a single organization, individuals today are increasingly building careers from a series of patchwork moves across organizational boundaries. In charge of their own work paths, and their own definitions of career success, more and more employees are looking for work environments where they can be engaged and feel that they are contributing in a positive way to something larger than themselves. All of these dynamics have made monitoring and managing employee engagement more critical. Managers need to ensure that they have both the right information and the right guidance to identify and tackle opportunities to enhance engagement levels.